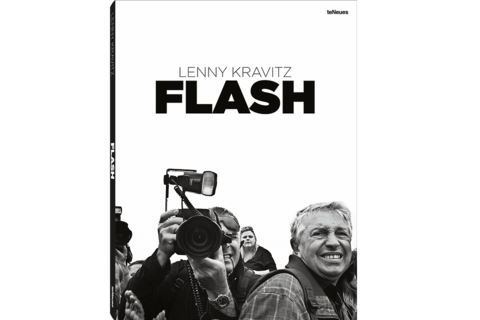 The publishing house teNeues has announced the publication of Flash, a book with photographs taken by the rock star Lenny Kravitz, in February 2015. With his new title, Lenny Kravitz makes his mark in a new arena of the creative arts. During his childhood, Kravitz was enthralled by cameras, playing with them like toys instead of taking photographs. In recent years photographer friends taught him the fundamentals of photography by using a Leica. Intrigued by the possibilities, Kravitz began creating his own works, featuring close attention to the nuances and effects created by light. As he himself had been endlessly photographed by photographers, paparazzi, and fans, his perspective on aesthetics was decidedly unique. In Flash, he captures the essence of what it's like to be a rock star who's constantly in the public eye. The result: an intense exploration of the photographer and his subject. This thrilling collection documents Kravitz's world tours, offering a rare record of the nomadic musical life. Flash signals an exciting new chapter in the annals of rock photography. A must-have for fans of Lenny Kravitz and all those fascinated by the world of contemporary celebrity. The pictures in Flash were all captured with equipment from the Leica M system. The book will be distributed by the publishing house teNeues. Leica Camera AG will also be selling the book in Leica Stores and Boutiques. Media inquiries relating to the book will be handled exclusively by the publishing house teNeues. Images can also be obtained via teNeues.